Windows 8 delivered a number of major design changes, but none has been quite as controversial as the removal of the Start button and Start menu. Microsoft claims this was in part because people just weren't using it very much, but the sheer volume of complaints from users says otherwise, and there's now a host of tools you can use to get your Windows 8 Start button back. Some of these are commercial products, and if you're interested in this area, we would recommend you take them for a spin (try RetroUI and Start8) . You'll use the Start menu so much that it's absolutely vital to find a program which is right for you, and spending three or four pounds for a faster, more comfortable desktop could be a very good deal. If you're looking for a free Windows 8 Start Button replacement, though, there are some very interesting contenders to choose from - and restoring the Start button is just part of what they can do. Read on for the best free Windows 8 Start Button replacements. Classic Shell does an excellent job of restoring the Start Menu to Windows 8. In many ways it looks and feels just like previous editions, with Search and Run boxes, a Recent Items menu, a familiar shutdown menu, and more. You also get useful extras, like a menu of your Windows 8 apps - so you can launch them directly from the desktop - and the ability to switch to the Start screen with a click. The menu is just the start, though. Classic Shell will by default skip the Start Screen almost entirely, so you boot to the desktop. The package also provides enhanced toolbars and status bars for both Explorer and Internet Explorer. And it's highly configurable, so just about every feature can be turned on or off at will. Installing StartW8 gives you a Windows 8-style button rather than the usual orb, but click it and everything else looks very familiar: search box, All Programs and Shutdown menu, recently launched programs, common system folders (Computer, Control Panel) and so on. There are some useful optional extras, too, including the ability to automatically switch to the desktop after signing in, and ignore the lower-level hot button corner. StartW8 doesn't provide a way to disable the other hot corners, or launch your Windows 8 apps, though. It looks good and works well, but for real power you should look elsewhere. As you'll guess from the name, Start Menu 8 is mostly about bringing back the Start menu to Windows 8. And it mostly does this very well. The menu looked and behaved just as we expected, and you can even choose your preferred Start Button from one of six options. This isn't the only tweak on offer, though. The program can also help you bypass the Start screen and boot to the desktop, and you can even turn off Windows 8's "hot corners" with a click. 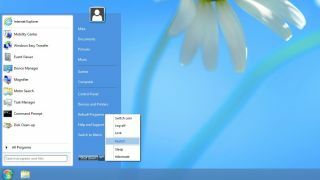 Start Menu 8 still doesn't have the features of some of the competition - there's no menu to launch your Windows 8 apps, for instance - but it's still a solid tool which delivers the basics well. ViStart gains major black marks immediately by the way it tries to force toolbars and browser tweaks on you as a part of the setup process. It is possible to bypass these "extras", though, and if you manage that then the program works quite well. ViStart can skip the Start Screen, booting you to the desktop; you're able to disable selected Windows 8 hot corners; and the interface is very configurable (you can choose your Start button, the menu style, decide which links go where, and more).